Originally published in 1940 in two volumes, this is the (partly eyewitness) account of the Leninist terror inflicted upon Russia. Maximoff, a life-long anarchist, fought in the Russian Revolution, organized with the metal-workers, and was imprisoned by Lenin’s secret police in 1920 when he refused to join the Red Army but not put down workers’ and peasants’ uprisings). Exiled, he wrote this incredible volume, in English. Over the course of nearly 400 pages, he recounts not only the Leninist terror and reaction against the popular revolution, but shows how the actions of Stalin followed deliberately in h is master, and mentor’s footsteps. The great Russian Revolution of 1917–21 was at first a ‘bloodless’ revolution. Nothing presaged at first that it would become most bloody in character and that by its senseless cruelty and inhumanity it would soon, as such, occupy the first place in the history of humanity. This turn of the Russian Revolution toward inhumanity, toward unrestrained and senseless bloodshed and destruction of human life is one of the historic paradoxes, for the basic trait in the character of the Russian people—that is, of the working masses—is kindness, humanness, love toward their fellow-being. This is shown even in the attitude toward criminals, who were always regarded by the Russian people as “unfortunates.” Russian criminal law was doubtless one of the most humane in the world and it precluded capital punishment for common crimes. Only revolutionists were executed by the Tzar’s government. Hardly any other literature was imbued as much as the Russian literature with the spirit of humanism, with the feeling of love and respect toward man. Russian Socialism, notwithstanding its tactic of revolutionary terror applied toward the Tzar’s government, was never bloodthirsty, terroristic and inhumane. It never viewed society as a disciplined batallion, never lost sight of the living personality with its needs and interests. The Socialism of Chernishevsky, Bakunin, Lavrov, Kropotkin and Mikhaylovsky was based upon the ideas of individual freedom, of regional and communal federalism, and it was this kind of Socialism that always prevailed in Russia. Jacobinism, with its terror and centralization, all the great influence of the French revolution notwithstanding, was never successful in Russia, and spokesmen of Russian Jacobinism—like Tkachev, for instance—never found themselves in the main stream of Russian Socialism, never exercised a noteworthy influence upon the latter. In a word, Russian Socialism was distinguished by its libertarian and progressive character. Reactionary notes began to sound in Russian Socialism with the appearance upon the Russian soil of political Marxism, which, to my deepest conviction, is an anachronism, a vestige of the dying past, and is altogether reactionary in its essence. The “Communist Manifesto” of Marx and Engels is a reactionary manifesto and is in striking contradiction to science, to progress in general, and humanism in particular. The demands of dictatorship, of absolute centralization, of political and economic life in the hands of the State, of “forming industrial armies, especially for agriculture,” of a regimented agriculture in accordance with a single plan, of raising the State to the position of an Absolute and the resulting stultification of the individual, its rights and interests—all that is nothing but the program of reaction which is incompatible with human progress, with freedom, equality and humanism. The realization of these demands inevitably carries with it state slavery. This came about in Russia. Even when Lenin was still alive, Karl Kautsky, the most prominent leader of the world Social-Democracy, was led to characterize the Russian regime as state slavery; he ignored thereby the rather obvious death sentence which he, by implication, had to pass upon political Marxism and the “Communist Manifesto” of Marx and Engels. But no less harsh a verdict was passed upon the “Communist Manifesto” by another eminent Social-Democrat, E. Vandervelde, who, much before Karl Kautsky, declared that “nearly all the educated people of France would find the Socialism advocated by the ‘Manifesto’ rather monstrous. Fortunately, the ‘Manifesto’ passed almost unnoticed in the social storm which swept over Europe immediately after it was issued; the first edition having come out in a limited number of copies, the ‘Manifesto’ soon became a bibliographical rarity. It was only in 1873 that it began to circulate in larger numbers, spreading from one country to the other”. In other words, the “Manifesto” began to spread after the defeat of the Paris Commune, after the break-up of the First International, that is, at the time when the reaction was at its highest and the Social-Democracy was opportunistically adapting itself to this reaction. Marxism came out “victorious” in the Russian Revolution, and this in itself is nothing short of a paradox: the Marxists owe their “victory” to their temporary renunciation of Marxism, effected in order to achieve their aim of seizing power. Lenin, being a consistent Marxist and consequently a reactionary, wrote together with Plekhanov in the “Iskra” that “the Proletariat cannot and should not concern itself with federalism.” If he had come out in 1917 with the ideas of the “Communist Manifesto,” developing them with as much energy as he showed in developing the ideas that were contrary to the “Manifesto,” he would have never attained success, and like Tkachev, the Jacobine, he would have remained a rather inconspicuous figure throughout the revolution. Lenin realized it only too well, and that is why he developed and popularized not the ideas of the “Communist Manifesto” but those of the “Civil War in France.” The ideas set forth by Marx in the latter pamphlet are in full contradiction to his previous as well as subsequent writings. The pamphlet was written under the pressure of the 1871 events in Paris and the prevailing spirit of the First International which threatened Marx with the loss of influence. By making concessions to Anarchist tendencies, Marx aimed to remove the growing dissatisfaction with his policies and to check the growing influence of the Federalists and Bakuninists in the First International. Had Marx not done it, had he based his pamphlet “The Civil War in France” upon the ideas of the “Communist Manifesto,” he would have been cast aside and would have ended his days in the remote by-ways of the course of socialism and the revolutionary labor movement. “Until now we wrote programs and kept on promising. At one time that was much of a necessity. We had to present a program and to promise a world revolution. If the Whiteguards, the Mensheviks included, inveigh against us on that score, this shows only that the Mensheviks and the Socialists of the 2nd and 21/2 Internationals never had any notion of how revolutions are made. We could not have started in any other way”. What did Lenin promise and what programs did he write in order to start the revolution? The answer is given by agitational and propagandistic writings of 1917. In speaking about “The tasks of the Proletariat in the given revolution,” Lenin wrote: “Not a parliamentary republic—this would be a step backwards as compared with the Soviet of the Workers’ Deputies—but a Republic of Workers, Peasants, Farm Laborers, Soviets all over the country from top to bottom.” “All power to the Soviets”, Lenin explained to the soldiers, means that “the entire power in the State, from the lowest to the highest rungs, from the remotest village to every single ward within the city of Petrograd, must belong to the Soviets of Workers’, Soldiers’, Peasants’ and Farm Laborer’s Deputies”. This new State will represent “a higher type of a democratic State, a State which in some respects, as Engels said, ‘ceases to be a State, is no more a State in the proper sense of the word’. This is a State of the type of the Paris Commune, which replaces an army and police force set apart from the people with an armed people”. In this State “the of Soialdom, the bureaucracy are either replaced with the direct power of the people, or, at least, are replaced under a special control, becoming not only elected deputies but ones that can be removed at the first popular demand, being indeed reduced to the position of pure and simple delegates. From a privileged set, receiving high emoluments on a truly bourgeois scale, they become workers discharging a certain kind of function and remunerated on a scale which does not exceed the regular wage of a skilled worker”. Lenin kept on reiterating: “not to permit the rise of totalitarian power of state officials”, “not to permit the re-establishment of a standing army set apart from the people, an army which surely will be back of any attempt to rob the people of its freedom”. That cannot be permitted to pass because “an officialdom that is appointed from above to ‘direct’ the local population always was, is and will be the main instigator of attempts to restore the monarchy, it being similar in this case to the standing army and the police”. Lenin taught that, “by state apparatus is meant first of all a standing army, police and officialdom”. This means that Lenin, in demanding the abolition of the army, police and officialdom impressed the workers, peasants and soldiers with the idea that a Soviet Republic is an Anarchist Federation of many thousands of Communes-Soviets scattered throughout the vast expanses of Russia, and that this Republic is a full democracy, developed to its logical end—the extinction of the State. It stands to reason that he had to endow this Republic with all kinds of liberties, which, he did rather in a liberal and unstinting manner. “The idea that it is necessary to direct the State through officials appointed from above is basically false, undemocratic, Caesaristic or is in the nature of a Blanquist adventure. “The introduction of ‘an appointed officialdom’ should not be tolerated. Only those organs can be recognized ‘which are created by the people themselves’ in a given locality”. “In a free country the people is governed only by those who are elected by it for that purpose.... That is why in free countries government of people is realized in the process of an overt struggle and free agreement among various parties”. “Freedom of press, means that the opinions of all citizens are given wide publicity. The state power, in the person of the Soviets, takes over all the printing shops, all the papers and distributes it justly. In the first place comes the State; in the second place come the big parties; in the third place, smaller parties, and then, any group of citizens enrolling a certain number of people and showing a number of signatures to that effect. This would be the real freedom for all, and not for rich people only”. “Peaceful demonstrations are only a form of agitation, and agitation cannot be forbidden, nor can only one kind of agitation be imposed upon the people. The Constitution of Free Republics CANNOT forbid peaceful demonstrations or any display of mass power on the part of any party, any group”. “In order to restore democratic institutions and liberties which have been trampled upon and crushed by Kerensky, the Bolsheviks are going to build up a government which no one will be able to overthrow”. What have all those ideas in common with the ideas of the “Communist Manifesto”? Not a thing! Here we have federalism, and in the “Communist Manifesto”, centralism; here we have democracy unfolded to its logical end, there—dictatorship; here we have all liberties, there, sheer coercion; here Communes with Soviets, there a centralized police state; here socialization, there nationalization; here persuasion, there intimidation—terror, in a word, here is freedom and there, only black reaction. But the people had no reason to suspect Lenin and the Bolsheviks of falsehood and deceit, the more so that Lenin, as soon as he had come to power, bombarded the people with decrees, granting it the right to carry into life the promises made during the preparatory period. At the same time each of these assurances was a deliberate lie, the greatest deliberate fraud and unprecedented deceit practiced upon the people—Lenin was following but one goal: he pressed onward to the realization of the Marx and Engels program set forth in the “Communist Manifesto”—to the so-called “Dictatorship of the Proletariat”, that is, toward party dictatorship, personal dictatorship, toward centralization and state totalitarianism in every domain of life. Having been guided in his moral actions by the principle of “the aim justifies the means,” Lenin, prior to the revolution, during the factional controversies and wrangles as well as during the revolution, never showed himself overscrupulous in choosing his means of struggle against adversaries: slander, lie, deceit, breach of faith, bribery, provocation, gross abuse, willful distortion of the adversary’s ideas—these were his weapons in the struggle for leadership in the party, as well as in the struggle for power in the country and for consolidation of this power. There is nothing surprising, then, that he chose such a ghastly road to power and setting up of dictatorship as perpetrating a fraud upon the people. Lenin understood wherein lay the error of the largest and most influential party—that of the Social-Revolutionists—which tried to confine the elemental forces within the channels of “law”, “order” and “discipline”. He understood that those elemental forces cannot be fought against, cannot be damned up, that they will erase and destroy all impediments put in their path. Lenin saw clearly that the best policy would be not to oppose those forces but to stir them up, to float along the wave set up by them, and to be carried on the crest of that wave. He saw the advantage of letting this wave spend itself riotously so that, when becalmed and subsided, it might sink into placid and meek submission to the new master. He sought to harness it for his own purposes, to make use of some of its unspent energies for the purpose of crushing any opposition. He sought to destroy the overt and latent inciters of the elemental forces of people, the new upsurge of which might wash away the foundations of the newly established power. It was those considerations that determined Lenin’s tactics during the revolution. Lenin set himself a definite aim, having mapped out the following course for its realization: A Workers’ State, to be realized via an All-Russian Commune: an absolute dictatorship, via absolute freedom; centralization via federalism; nationalization—that is, state monopoly—via socialization; terror via agitation and propaganda. In other words, the ideas set forth by Marx and Engels in the “Communist Manifesto” were to be realized via Marx’s ideas of “The Civil War in France”. Lenin could not come out openly with this provocation before the masses of people nor before the leaders and the rank and file of the party. That is why many of the eminent figures and active workers of the party could not understand the drift of his policies. And that is why they rebelled against him. At the very beginning, when Lenin made the party cast off “the dirty shirt of Social-Democracy” and put on instead the clean ones of Communism, he met opposition on the part of the editors of “Pravda,” Kamenev and Stalin. And then, after he had overcome this opposition by the use of every means at his disposal, after he had infused the party with a new faith in this program based upon Marx’s pamphlet “The Civil War in France,” he again faced opposition when, acting in accordance with his preconceived plan, he began urging that the program be shunted once more to that of the “Communist Manifesto.” Almost on the morrow of the October upheaval, contrary to what he had upheld in the pre-October tactics and propaganda, Lenin categorically rejected a coalition with the Social-Revolutionists and Social-Democrats. When he thus openly revealed that he was heading toward a party and personal dictatorship the newly formed government was split wide open by the resignation of Noghin, Rykov, Miliutin, Theodorovich, Riazanov, Derbishew and Shliapnikov, and the Central Committee of the Party was also split by the resignation of Miliutin, Zinoviey, Kamenev, Noghin and Rykov. The present dictator of Russia, Lenin’s heir and disciple, Stalin (Dzhugashvili) caught on to Lenin’s tactics only many months after the October upheaval. He let the cat out of the bag, by declaring in one of the articles written in 1918 in which he said that they, the Bolsheviks, “are heading toward centralism via federalism.” As we already pointed out, five years later Lenin admitted as much as that. Moreover, he admitted that all the decrees issued in the first period (1917–1918) after the October upheaval had the same meaning as the pre-October propaganda, that is, their object was to gain the confidence of the masses and to allay any suspicions. That was the only angle from which Lenin evaluated the decrees, hardly attributing any other significance to them and not considering himself bound by them to any extent. “At that time,” Lenin told the delegates at the party convention, “we went through a period when decrees were to us a form of propaganda. We were laughed at, we were told that the decrees were not being executed, that the White-Guardist press was full of sneers at our expense. But this was quite to be expected. It was quite logical on our part, at the time when we had just taken the power in our hands, to say to the rank and file workers and the peasants: This is the way we should like to see the state governed, here is a decree—try it out. To the ordinary worker and peasant we presented our ideas of politics in the form of decrees. The result was the gaining of the enormous confidence which we now enjoy with the masses of people. This was a necessary period at the beginning of the revolution; without this approach we should have never gained the leadership of the revolutionary war, being forced instead to lag behind it. But this period is a matter of past history—something we refused to see”. In addition to these admissions made by Lenin, we have his policy followed after the October upheaval, substantiating our contention that the ideas advocated by Lenin in 1917—that is, the ideas of 1917—were viewed by him only as mere propaganda, that he did not believe in them, inveterate believer in the State that he was, he felt an organic hostility toward those ideas, using them as expedients to clear the road to power, to dictatorship, the road toward the “workers” totalitarian state of Marx and Engels. And, if this is not sufficient, I shall cite here two characteristic and convincing instances. One of Lenin’s fighting slogans hurled against the Provisional Government was the demand to abolish the death penalty at the front and in the rear-guard. But no sooner did the October revolution take place, no sooner did Lenin make his appearance within the walls of the Smolny palace, than he began working himself into furious indignation when he learned of the abolition of the death penalty. Cynically and bitingly he scoffed at this mollycoddling and silliness.... And he quietened down only when it was decided to begin executions without revoking the decree abolishing the death penalty. This is what L. Trotzky, next to Lenin the most prominent theoretician, ideological defender and instigator of the Russian terror tells of Lenin’s endeavors in that direction. He tells it without evincing the slightest trace of indignation over such cynicism and seemingly making common cause with it. “Kamenev tried to prove that what was meant by that act was to abrogate Kerensky’s decree directed against soldiers who deserted from the army. But Lenin was irreconcilable on that point. It was clear to him that this act implied an inadequate realization of the unusual difficulties toward which we were heading. ‘It is a mistake,’ he kept on repeating, ‘an inadmissible weakness, pacifist illusions, etc.’ He suggested the immediate, abrogation of this decree. This was argued against, the opinion being that this was liable to produce a very adverse effect. Someone said: ‘It is better to fall back upon shooting when it becomes clear that there is no other way out.’ And that was the final decision. “Those speeches expressed his actual sentiments. In accordance with his method Lenin was hammering into the heads of the people the realization that exceptional drastic measures were needed in order to save the revolution”. We have quoted L. Trotzky’s article in full because of its great interest and importance. This article not only confirms what we said above about Lenin, but also reveals to us the true Lenin; not the Democrat and Socialist, but the Terrorist, the initiator and ideologist of terror in the Russian revolution modeled upon the terror of the French revolution. Of this, however, we shall write later in its proper context. “The question of setting up a coalitionary government was brought forward by the VIKZHEL (The All-Russian Executive Committee of Railway Workers) immediately after the proletarian revolution triumphed in Petrograd. That was before the outcome of the street fighting in Moscow had become known. Nor had the situation in the active army yet become clarified by that time. (And nothing was known about the situation all over the country.—G.M.) The Left Social-Revolutionists were inclined toward such a coalition. At their insistence a series of conferences took place in the VIKZHEL, with the participation of Bolsheviks and the moderate Socialist groups. At those conferences was brought forward the project of setting up a “Socialist government” by expanding the Soviet Central Executive Committee to 150 people, this body to be supplemented by 75 delegates from the provincial Peasant Soviets, 80 from the Army and Navy, 40—from the Trade Unions, 25—from the AU-Russian Professional Associations, 10—from the Central Executive Committee of the Railway Union, 5—from the Postal and Telegraph Workers and 70 deputies from the Socialist section of the Municipal Council of Petrograd. This expanded Central Executive Committee was to guarantee, according to this projected plan, 60 percent voting strength to the Bolsheviks. In the projected government, which was to be responsible before the Central Executive Committee, the Bolsheviks were to control no less than 50 percent of ministerial positions, which would include the Ministry of Labor, Ministries of Internal and Foreign Affairs. This project was taken up for discussion by the Central Executive Committee of the Communist Party on November 2. The project was rejected, it having been found that the Party could enter into coalition only with the Left Social-Revolutionists”. The coalition plan was rejected notwithstanding the protests of a minority within the Central Committee of the Party and the protests of a minority within the Council of People’s Commissars. The question was not brought up for discussion at the plenary sessions of the Central Executive Committee of the Soviets, nor was it laid before the party as a whole. What does it mean? It means, first of all, that Lenin’s pre-October propaganda, which reduced itself to the development of the ideas and principles of the Paris Commune, was nothing but a hoax and mere chicanery; it means that Lenin had in mind something altogether different when he said that, “In a free country, government of people is carried on in the process of an open struggle and free agreement among various parties”; secondly, that Lenin from the moment he arrived at power, decided upon a course of a party and personal dictatorship; thirdly, it means that Lenin declared war on the so-called Social-Democracy as well as upon the bourgeoisie and capitalists. It means that the responsibility for the continuation of the Civil War, for the destruction of the national economy, for oceans of blood, for millions of people who perished from hunger or fell on the battlefields—that the responsibility for all that falls upon Lenin and his party. This is obviously the case since an understanding among the Russian Socialists would either obviate the necessity of waging a civil war by placing the feeble Russian bourgeoisie and the military clique in a position where resistance would become nearly impossible, or it would have reduced the resistance of the counter-revolutionary elements to isolated outbreaks, which the Soviet government would find little difficulty in suppressing. This is borne out by the fact that while the “Socialist Democracy” and the masses of workers and peasants following it were still enjoying a certain measure of equality and civil liberty, they took an active part in the defense of the revolution against the onslaughts of reactionary elements. Although keeping up their ideological struggle against the Bolsheviks, they knew how to draw the line between the party struggles for power and the cause of the revolution. It was due to this attitude on the part of the revolutionary democracy that Lenin could declare on April 29, 1918, that “the main task of facing the resistance of exploiters has been solved already in the period from October 25, 1917, until February 1918 or until the surrender of General Bogayeysky’. The so-called October revolution was in fact but a simple upheaval. It was the seizure of power by way of organizing and engineering a plot and rebellion within the capital, in the hope that the country would follow the example of Petrograd in case the rebellion succeeded. It was a dangerous Blanquist adventure which had all the chances of success in Petrograd but not in the country as a whole. “Socialist Democracy”, Social-Revolutionists, Social-Democrats (Mensheviks)—were the dominant element. Then there was the army which, notwithstanding its war weariness, its eager longing for peace, its disorganization and the vanished influence of the officer corps, was still in the great unknown at that particular moment, the probability of an internecine strife among the various army units not being precluded. Likewise the Communist Party, being small in numbers, could not hope to take over without any resistance by the government apparatus in the provinces, nor could it hope to implement it with forces of its own. The street battles in Moscow were quite symptomatic in this respect. And still, all that not-withstanding, Lenin rejected the proposal to form a coalitionary Socialist government, that is, he knowingly took a course upon civil war to be waged not only against the exploiters, but also against the “Socialist Democracy”, against the great mass of workers and peasants rallied behind the banners of this democracy; he was knowingly heading toward the establishment of dictatorship and government through terror. Lenin won, just as Hitler and Mussolini were winners before the war, because the Socialists shrank from the challenge of civil war. Russian Socialists shunned civil war because of their feeling of responsibility to the country and revolution, because of their fear of German invasion and restoration of monarchy, because of the fear of economic collapse. It was this prevailing spirit among the Socialists and the peaceful tactics they used in the struggle against the Bolsheviks that were skillfully exploited by Lenin with the view of the total annihilation of both Socialists and Anarchists. Does not all this prove that the ideas of Federalistic Communism and genuine Libertarian Socialism advocated by Lenin prior to the seizure of power were only the means to an end, his true aim being dictatorship and the centralized totalitarian state of the “Communist Manifesto”? Indeed, it does. Lenin himself let it out in his polemic against Maxim Gorky’s paper “Novaya Zhizn”. “When the State has become proletarian, when it has become the apparatus of violence exercised by the workers over the bourgeoisie, then we shall affirm our allegiance to centralism and strong government”. I shall cite another instance showing that Lenin never entertained the idea of realizing the “Soviet Democracy” and that, from the very moment he came into power, he placed himself and his party in the position of a dictator. Only ten days after the seizure of power, on November 17, 1917, Lenin, in his capacity of Chairman of the Council of People’s Commissars, was presented with an interpellation on the part of the left Social-Revolutionists who submitted it at the session of the AU-Russian Central Executive Committee of the Soviets. “... Of late a number of decrees were published in the name of the government. These decrees were not discussed in the Central Executive Committee nor were they sanctioned by it. The same procedure was characteristic of certain governmental acts, which, in fact, have abrogated the principles of civil freedom. “1) On what ground were the drafts of the decrees and other governmental acts kept from being submitted to the Central Executive Committee for regular discussions? “The new power had to brush aside various formalities which might have raised serious obstacles. The moment was too serious and, under the circumstances, no delay could be permitted. No time could be wasted upon smoothing out certain rough points, all of which is really a matter of exterior finish, changing but little in the essential nature of the new measures of the government”. Thus from the very first days Lenin began to ignore the Central Executive Committee, the parties represented in it and also his own party, and to “govern” and legislate in a dictatorial manner. It is clear then that Lenin’s advocacy of the ideas of the Paris Commune prior to the October upheaval were meant only for mass consumption, were meant as a bait, as a means to gain the sympathies of workers and peasants, as a weapon clearing the road to power. His aim was “Dictatorship of the Proletariat”—a dictatorship of the Party and that of his own person, a centralized “Workers’ State” as a monopolist, that is, an absolute totalitarian state which governs by means of violence and terror. “The democrats will either strive for a federated republic or, they cannot get along without an indivisible republic, they will at least try to weaken the central government by granting the widest measure of autonomy and initiative to the communes and provinces. As against that, the workers should strive not only for a single and undivided German republic, but the most vigorous centralization of power in the hands of the state. They should not let themselves be hooked upon the bait of this democratic chatter about the freedom of communes, self-government, etc., like France during the year 1793. The carrying out of the most vigorous centralization of present day Germany should become the task of a truly revolutionary party”. “Since our  state is only a transitional institution which is to be used during the struggle, in the revolution, in order to suppress violently our adversaries, it would be sheer nonsense to speak of a free state of the people; as matters stand, the proletariat still needs the State; he needs it not in the interests of freedom but in order to be able to suppress his enemies; freedom will be on the order of the day only when the state as such will have ceased to exist”. It was upon this canvas that Lenin drew his patterns of “Socialist” construction in Russia and built the “Dictatorship of the Proletariat”. Those were the starting points of his methods of struggle not only against the enemies of the proletariat, not only his own enemies, but his adversaries, as it was taught by Engels. Lenin thus defines the “Dictatorship of the Proletariat”: “The revolutionary Dictatorship of the Proletariat is the power conquered by the proletariat and maintained through violence over the bourgeoisie, it is a power unbound by laws”. “The State it is we”.... We are the Party, and the Party—that is, the party and the party apparatus,—that is Consequently, the State—that is I and only I A Marxist Louis XIV—such is the inescapable conclusion of the logical unfoldment of political Marxism in practice, in life.... The Workers’ Socialist State, the “Dictatorship of the Proletariat” is crowned by a Louis XIV, that is, by a benevolent despotism, by absolutism. It is an inescapable logical necessity.... “Our State” is an absolutist State built not only in order to destroy our enemies, but mainly in order to suppress our “adversaries”. And there are always more adversaries than enemies. The enemies are the capitalists, landlords, generals and priests. And as to adversaries, they comprise, in the first place, those that stand outside the pale of the collective “we,” that is, outside the Party. Those millions of people who are “not our people” fall into two categories of adversaries: those who do their own thinking, who have their own Socialist views and their own ideas as to the ways and means of building up Socialism. Various Socialists and Anarchist groups, parties, workers’ unions, cooperatives, various societies—all those belong to the class of direct and permanent adversaries. The other group consists of the vast mass of passive elements who only at times, sporadically and on specific occasions bring forth adversaries from their midst, that is, the group of potential adversaries. It follows hence that all “adversaries” must be disfranchised and deprived of their liberties. But before that could be done they had to be crushed or physically undermined. The Russian bourgeoisie had already been undermined in the February revolution and was finally broken by the October upheaval. The masses of the people could only sympathize with any attempt to outlaw the vanguard of the Russian bourgeoisie—the Cadet party—and so on December the first, this party was declared the “enemy of the people”. Four months later it already became clear to Lenin that, “by now the Marxist tenet has been amply demonstrated, stating that Anarchism and Anarcho-Syndicalism are bourgeois movements which are in irreconcilable contradiction to Socialism, Proletarian Dictatorship and Communism”. “The threat to restore bourgeois ex-ploitation was held out to us only recently in the person of Kornilovs, the Gotzes, the Dutovs, Gheghechkoris, and the Bogayevskys. We vanquished them. But now we are threatened with another restoration, which asserts itself in a wave of petty-bourgeois license and Anarchism, in the trivial, petty but numerous invasions and attacks of the petty-bourgeois elemental forces against proletarian discipline. This flood tide of petty-bourgeois Anarchy has to be vanquished, and we shall vanquish it”. “The nearer we come to the full military suppression of the bourgeoisie, the more dangerous becomes to us the high flood of petty-bourgeois Anarchism. And the struggle against these elementals cannot be waged with propaganda and agitation alone, by organizing emulation, by selecting organizers; the struggle must also be waged by applying force and compulsion”. The Anarchist movement was therefore declared to be clogged up with “bandits” of which it had no power to rid itself. And so the authorities took upon themselves this business of “purging” the Anarchist movement via a military pogrom. On the night of April 12, 1918, the backbone of the Anarchist movement was broken, its organizations were smashed, its newspapers closed up, members of the movement were arrested and some, like Khodounov, were assassinated. The next turn came for the right sector of the Russian Socialism, whose representatives (Social-Revolutionists and Social-Democrats) according to Lenin, “could pass for Socialists only among fools or renegades like Kautsky”. for “neither the Mensheviks nor the Social-Revolutionists (who preached Socialism) can be classed as Socialists”. “It would be a mistake to view them as Socialists.... In reality they are the representatives of the Russian petty-bourgeoisie”. Inasmuch as according to Lenin this “petty-bourgeoisie”represented millions and millions of the small toiling peasants, they were dangerous to the “Dictatorship of the Proletariat” and therefore had to be destroyed or rendered harmless. And so on June the Social-Revolutionists and Social-Democrats were expelled from the All-Russian Central Executive Committee of the Soviets, that is, they were outlawed and declared “enemies of the people”. Thus there remained only the Left Social-Revolutionists who shared power with the Bolsheviks. On January 11, 1918, Lenin said the following about this party: “The party of the Left Social-Revolutionists is the only party which expresses the aspirations and interests of the peasants”. And it remained such in Lenin’s eyes as long as it kept on “yessing” his policies, that is, until the Brest-Litovsk peace, which it rejected and which it attempted to undermine by assassinating the German Ambassador Mirbach. It was then that the Bolshevik authorities swooped down upon it, suppressing it with most ferocious measures. It was then that they became to Lenin, “the accomplices of the Whiteguardists, landlords and capitalists”. Lenin promised “ruthlessly to expatriate the betrayers, the ‘Socialists’ in quotes who are not worth a penny.” “A Left Social-Revolutionist who keeps on emphasizing the fact that he is Left, who camouflages himself behind a revolutionary phrase but who in reality rises in revolt against the Soviet power, is a hireling of the Yaroslav Whiteguardists”. Having disposed of the political parties and groups, Lenin betook himself to peasants and workers. The provocatory policy of persecution pursued by the Bolshevik authorities placed those parties and groups in a position which left but two ways out: either to take up arms or, fearing the repercussions upon the revolution which such a policy of armed defiance might produce, to sacrifice themselves by condemning themselves to legal activities of an open opposition and let themselves be crucified daily by the Bolsheviks until political and physical death should overtake them. Following these parties and groups, there came the turn of the great mass of peasants and workers. Almost the entire peasantry of Russia with very few exceptions found itself in the category of enemies. The food policy which reduced itself to grain requisitions carried out by armed detachments who were indiscriminately taking away the grain of the peasants—rich and poor alike—resulted in a number of peasant rebellions throughout the country. Fixed grain prices under conditions of great scarcity of commodities and total depreciation of currency, were in fact but a form of ordinary plunder perpetrated not only in regards of the kulaks but the entire peasantry. Rich peasants, middle peasants as well as poor peasants refused to sell grain. It was then that Lenin declared them “enemies of the people” and friends of the capitalists, opening up a mad campaign against peasants with the help of “the committees of poor peasants”. “Those who know what indescribable torments of hunger the people are suffering now and still refuse to sell grain at prices acceptable to the middle peasants—those are the people’s enemies. They ruin the revolution and promote violence, those are the friends of the capitalists. Upon them we declare war—a ruthless war”. And so war was unloosed upon the peasants. The “kombieds” (committees of poor peasants) wrought so much damage and did so much to provoke a sweeping wave of peasant rebellions throughout the country that by November of 1918 the government was compelled to dissolve them, but it could not undo the destructive effects of their work. The next category of enemies and adversaries was that of workers who dared to demand that the situation in regard to food provisioning be improved. Such workers were to Lenin also scoundrels sold to the bourgeoisie. Thus the Marxist centralized state created for the purpose of “violent suppression of its adversaries” resolves the entire population into its adversaries, that is, save an insignificant section of the “proletariat”—its so-called “vanguard”. And since “we are the vanguard, we,” that is, the Party, “are the Proletariat raised to the ruling power,” which enslaves the population for the sake of freeing and enfranchising it, for the sake of creating a “Proletarian Democracy”. Yes, it creates a proletarian democracy, for, according to Lenin, “a dictatorship does not necessarily imply the destruction of democracy for the class which exercises this dictatorship over other classes”. For instance, “the rebellions of or dissatisfaction among the slaves of antiquity revealed the essence of the State of that Period as the Dictatorship of the Slaveholders. Did this do away with democracy among slaveholders exercised in their own midst? Everyone knows that this was not the case”. The “Dictatorship of the Proletariat” is thus a slaveholders democracy which, as distinguished from the one of the ancient world, has for its aim freedom, economic equality, freeing the entire population from slavery, and all this is to be realized ... by enslaving the entire population! Could there be a more absurd theory? Indeed, it is the most absolute nonsense, a theory fit for the madhouse. And it was in the name of this absurdity that the rights of the man and the citizen conquered by the Russian revolution were anathematized, were burned out with a glowing iron and were washed out, reeking with human blood. Since “a free State is pure madness”, Lenin, upon reaching power, began to build a Proletarian State in accordance with the recipes given by Marx and Engels. It was “our” State (for “the State it is the workers, it is the vanguard, it is we”), the State of “our Party”, of my party, my State, set up for the purpose of “violently suppressing its adversaries”, in order to clear the road to freedom, Socialism and Communism. Lenin thus became the opposite of Lenin of 1917, of the Lenin who tried to persuade the masses and to gain their confidence. But now that he began to govern and build a slaveholding democracy, freedom and equality became bourgeois prejudices standing in the way of the new construction and which therefore have to be fought ruthlessly. “A ruthless exposure of the petty-bourgeois democratic prejudices in regard to freedom and equality”. “Anyone who speaks of freedom and equality within the framework of a toiler’s democracy is thereby a defender of exploiters”. Any discussion of and argumentation about freedom began to be branded as “senseless argumentation”, “mere prattle and phrase-mongering” about which “one has to rise”. Freedom of the press and criticism became “meaningless things”. Democracy became mere “sentimentality” and “prattle”. “... All this sentimentality and prattle about democracy has to be cast overboard”. “An open proof of one’s Menshevism (that is democratic convictions—M. G.) should be sufficient ground for our revolutionary courts to confer the highest punishment, that is, shooting.” In the same manner Lenin made short shrift of the other rights and liberties of the population which workers and peasants conquered during the revolution. Such became the fate of freedom of press and association, of freedom of conscience, of freedom of parties and nationalities, of freedom of thought and science, of freedom of literary creative work and research, of freedom of agitation and propaganda, of freedom of demonstrations, strikes and independent labor unions, of freedom of teaching and education, of the inviolability of person and domicile, of local autonomy and rights granting a certain measure of independence from the State. One may ask then whether this does not represent reaction pure and simple, whether this is not in its essence but the reactionary ravings of an obscurantist and despot? For isn’t all that a super cynical attempt to replace Socialism with the most primitive gross and barbarous form of despotism? Isn’t that the essence of tyranny and absolutism? Is it possible, without using organized violence and terror, to subject the entire population to “the Dictatorship of the Proletariat”, that is, to the dictatorship of the Party, that is, of the Party clique, that is, of the leader of the clique and the Party? Is it possible to create a slave-holding democracy without doing away with the freedom and rights of workers and peasants? Of course not! It is impossible because it would be naive to think that workers and peasants, the professionals, could all be taken in by the name “proletarian dictatorship” and that, like St. Augustine, they would come to believe in this absolute absurdity because it is an absurdity. It is improbable that they would believe that freedom can be arrived at via enslavement, equality via inequality, humanity via inhumanity, the abolition of the State via its strengthening and that initiative can be developed by first having it stifled. Just the opposite is true. Proceeding from the formula of progressive evolution one can and should expect that notwithstanding the artful deceit, this recoiling of progress upon its backward path, its sudden metamorphosis into regress, will meet strong resistance which can be suppressed only by the most frightful terror and arbitrary rule. Lenin knew it, he knew that men are not guinea pigs and that they will not, if they can help it, let themselves be vivisected for the sake of Party experiments. That is why Lenin kept on preparing himself to deal with this certain reaction of the people to his experiments. He studied the revolutions of other countries, and especially the Great French Revolution, he studied terror, for he saw clearly the terroristic nature of the Marx and Engels State. That is why, having in view the seizure of power, he lied when he demanded from the Provisional Government the abolition of the death penalty, he knowingly lied when he promised to restore the liberties trampled down by Kerensky and to abrogate the death penalty. While demanding that, he had something else in view and his indignation was great as testified by L. Trotzky when he learned that Kamenev had published a decree abolishing the death penalty. Since he was, like Marx and Engels, a Jacobine, he thought in terms and images of the latter. He could not conceive a revolution without terror and he held that the French revolution became great only because of terror, and that the Russian revolution can be great and successful only if it pursues a terrorist policy which being built upon “scientific Socialism”, upon “the scientific organization” of Marx and Engels, upon the class struggle, is bound to yield totally different results from the Jacobin terror of 1793. “The great bourgeois revolutionists of France of 125 years ago made their revolution great by the use of terror against all the oppressors, the landlords and capitalists”, wrote Lenin in September, 1917, in the pamphlet “The Threatening Catastrophe and How to Overcome It”. And on December the first of the same year, he said by way of bringing up his strongest arguments in favor of his latest act outlawing the Cadet Party: “that is the way the French revolutionists acted”. Five months after he had arrived at power, Lenin insisted in his pamphlet, “On the ‘Left’ Infantility and Petty-Bourgeois Manifestations” upon the necessity of applying the most resolute terroristic measures and not to stop short even before their barbarous character. “While the revolution in Germany still tarries, our task should be to learn from the Germans how to run state capitalism, by all means to copy it from them and not to spare dictatorial methods in order to accelerate this process of taking over from the Germans, doing it at an even more rapid pace than the one followed by Peter the First in Westernizing barbarous Russia, without stopping short before the most barbarous means of struggle against barbarity”. The same demand Lenin reiterated in 1921 in his pamphlet: “On the Grain Tax”. Those were the guiding ideas of Lenin’s policies as well as of those of his faithful disciple Joseph Stalin. 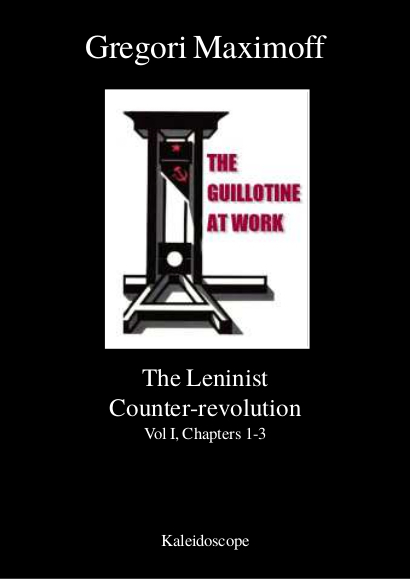 But a guillotine was not enough for Lenin, he sought out stronger methods of terrorization, methods which combined with the guillotine would transcend anything the world had known until now. Those means he discovered in the “military socialism” of the warring capitalist states—terror by starvation. “The grain monopoly, the rationing card and universal labor service are in the hands of the Proletarian State, in the hands of the Soviets, vested with full powers, the most powerful means of control and accounting. Those means when applied to capitalists, to the rich and to the workers, will furnish a power unprecedented in the annals of history, which will ‘set into motion’ the state apparatus, will overcome the resistance of the capitalists and will keep them in subjection to the proletarian state. Those means of control and compulsion to work are stronger than the laws of the Convent and the guillotine. The guillotine only terrorized, it only broke down active resistance. But this is not enough for us. “It is not enough to ‘cow’ the capitalists in the sense that they should feel the might of the proletarian state and should forget about showing active resistance. We have to break down passive resistance which doubtlessly is the most harmful and dangerous one. And not only do we have to break down any sort of resistance, but we have to compel them to work within the organizational framework of the new state. It is not enough to ‘chase out’ the capitalists (one has to “remove” the unfit, hopeless “resisters”) and place the others in the service of the state. This refers to the capitalists and the upper layer of the bourgeois intellectuals, high salaried employees, etc”. “And—Lenin continues—we have such means in our possession. It is the grain monopoly, the bread card, the labor service conscription.... The Soviets will introduce the work book for the rich and then gradually for the entire population”. When Lenin came to power, he began coolly, warily and cunningly to organize this terror “for the purpose of forcible crushing of its adversaries”. And the adversaries, as we have already shown, were all those who were outside the party—and not a few of them were within the party itself. The prevailing spirit of the mass of workers and peasants who became imbued with the agitation against the death penalty carried on by the Bolsheviks in the Kerensky period, was not altogether receptive to an open declaration of terror; nor was it politically expedient to come out openly in favor of a policy which was only recently combatted—this would furnish an additional weapon into the hands of enemies and adversaries. It was necessary to prepare the masses. It was necessary to instill a taste for terror and murder among the members of their own party as well as that of the allied party of the Left Social-Revolutionists. It was necessary to train the working masses to become indifferent toward executions and to regard them as matter-of-fact occurrences. Acting upon Lenin’s instructions, the Bolshevik press and agitators raised a furious campaign against the other parties, groups, movements and persons. Slanders, lies, deceit, the most frightful frame-ups began to rain down from this inspired source, far outstripping the propaganda methods of the pre-October period. At the same time, following the understanding reached between Lenin and the leaders of the party, terror in all its forms—that is, persecution and assassination, was gathering momentum. During this period which was “preparatory” to the unloosing of the wave of terror, from October 25 (Nov. 7) to April 29, 1918, Lenin himself was rather reserved in his open encouragement of terror and murder in regard to any one taken in the act of committing a crime. He still remembered the noble act of the Petrograd workers who released general Krasnov upon his promise not to take up arms against the Soviets. And although at that time Lenin grew indignant about this act, branding it as “an intelligentzia-bred prejudice against capital punishment,” he nevertheless was restrained by this “prejudice” for five months from coming out openly with the scandalous-in-form and depraved-in-essence bloody propaganda and agitation to which he gave himself up till his very last days. Lenin directed his first blow against the bourgeois papers, which category gradually embraced all newspapers with the exception of the Bolshevik and government publications. “To tolerate those papers,” Lenin said at the session of the Vzik (All-Russia Central Executive Committee of the Soviets), November 4, 1917—”is to cease to be a Socialist”. Since the Soviets were still in the throes of an armed struggle against Kerensky whose attempts to regain power had not yet been suppressed, Lenin refrained from calling for a terroristic policy: at that time he was demanding not heads, but the suppression. On the first of December, 1917, as we already pointed out, Lenin, with due references to the French Revolutionists, outlawed the Cadet party; on December 14 he assured the All-Russian Central Executive Committee that “no one, save the Utopian Socialists, ever denied that it would be possible to triumph without meeting resistance, without a Proletarian Dictatorship, without putting an iron hand upon the old world,” and that “this iron hand creates while destroying”. On January 11, 1918, in his address on the work of the Council of the People’s Commissars, delivered before the Third All-Russian Convention of Soviets, Lenin told the delegates that, “the experiences furnished by the civil war shows clearly to the peasants that there is no other road to Socialism save the Dictatorship of the Proletariat and the ruthless suppression of the rule of the exploiters”. But “we are still far from a real terror, because, for the time being, we are stronger than they are”. “In answer to the charge made here that we are combating ‘Socialists’ we can only say that in the epoch of parliamentarism the latter have nothing in common with Socialism, that they have rotted away, have become outdated and have finally gone over to the bourgeois. ‘Socialists’ who, during the war, provoked by imperialist motives of international robbers were shouting about ‘defending the fatherland’—are not Socialists, but tuft-hunters and bootlickers of the bourgeoisie”. This answer shows clearly that the attempts of the Socialists to enter into coalition with the Bolsheviks were met by Lenin not only with a rebuff, which provoked a crisis in the Central Committee of the Communist Party and in the first Bolshevik government, but also with persecutions. And it stands to reason, for even prior to the seizure of power Lenin wrote in the article “On Compromises”: “Our party like any other political party, aims to obtain political power for itself” and that “events may place us in power, and we are not going to let that power slip from our hands”. One has to bear in mind that the chief competitors, in the realms of ideology as well as in the struggle for power, were the Socialists and not the bourgeois. Strongest among those competitors was the party of the Social-Revolutionists which, due to its heroic past, became the strongest party after the fall of the monarchy. Already after the October upheaval this party had a predominant majority in the Constituent Assembly and not-withstanding the propagandistic decrees of the Bolshevik government, it still continued to be the party of the majority of the population, having a solid backing in the villages as a result of its pre-revolutionary activity, and its work in promoting peasant co-operatives. It stands to reason that Lenin had to direct his blows against this party and its ally, the Social-Democracy, which had quite an influence among the city workers. Lenin and the Bolshevik party did everything possible to compromise those parties in the eyes of the peasants and workers, to provoke them, to make it appear to the masses of workers and peasants that those parties had placed themselves at the other side of the barricades, that they sided with the landlords and generals. The Bolshevik aim was to annihilate those parties, morally and physically, by making them into a symbol of counter-revolution. From the first day of the upheaval the legal activity of the parties became the object of persecutions. Their publications were being closed up and at the same time they were being vilified in the most persistant, tenacious, deliberate and systematic manner. They were purposely linked up with counter-revolutionary generals, with counter-revolutionary attempts, they were persistently labeled as counter-revolutionists, agents of the Entente, bootlickers of the bourgeoisie. For instance the Brest-Litovsk peace was resolutely opposed by the Socialist parties, Anarchist groups and even a considerable section of the Bolsheviks headed by Bukharin, Fiatakov, Bubnov, Osinsky, etc. who even began to publish their own paper “The Communist”and named themselves “Left Communists.” All that, notwithstanding, Lenin on March 7, 1918, at the session of the Fourth extraordinary All-Russian Convention of the Soviets, in his address on the Brest-Litovsk peace, had the temerity to refer to them in the following language. “The further continuation of the war will lead us to a defeat and a debacle.... That is why all the counter-revolutionary advocates of this new carnage, echoed by the Mensheviks, the Chernov, Tzereteli and the “Dielo Naroda” crowd  became so vociferous in their demand for war; to them it is a selfish problem, it is demanded from them by their class interests, by considerations of their own personal benefit. That is why they uphold this point of view in their counter-revolutionary writings. “Outcries: ‘Our papers have been closed... Of course, unfortunately not all of them! Soon all of them will be closed....(stormy applause) the Dictatorship of the Proletariat will wipe out the shameful purveying of bourgeois opium. (Stormy applause). “We can now very well understand their wailing about the foul peace, the wailing of those who are giving a rapturous reception to the German imperialists, who are now invading the territory of the Revolutionary Republic. They are rooting for war, but what they are really after is to have the Soviet State fall into a trap”. At last Lenin succeeded, as a result of this persistent policy, in exasperating the majority of the Social Revolutionists and some groups of the Social-Democratic organization to the extent of provoking them into armed rebellion. In May 1918, that is a half year after the October upheaval, they let themselves become involved in the Czecho-Slovakian adventure. They made common front with the rebels, the front of the Constituent Assembly, the People’s Army, and of course they soon were entangled in the snare of Admiral Kolchak. Having ruined forever their standing with the masses, they signed their own death sentence. Lenin got what he wanted. On April 23, Lenin spoke in the Moscow Soviet. This speech was the prelude to an open turn in Lenin’s policies, to the policy of an open struggle against the people with their revolutionary conquests, a struggle waged with the view of building up a “Dictatorship of the Proletariat” and carrying out the program laid down by Marx and Engels in the “Communist Manifesto.” This was a turn toward an official course of open terror, toward a blind and frenzied advocacy of terror to be directed against each and everyone; in a word, Lenin, following in the footsteps of the French Jacobins launched upon his program of exalting via terror the Russian Revolution into a Great Revolution. In that speech, Lenin complained that until that time the Soviet Power had been in the nature of “a jellyfish and not that of iron.” He held out the threat of ruthless terror not only toward enemies and adverseries, but likewise toward the hesitating members of his own party. “The Soviet Power,” said Lenin by way of writing up his speech, “in many cases did not evince sufficient determination in its struggle against the counter-revolution, thus far proving itself jellyfish and not a thing made of iron, and on this Socialism cannot be built. We have not yet overcome the petty-bourgeois forces.” (To the latter category Lenin relegates the entire peasantry, the Anarchists, Social-Revolutionists, Mensheviks, the Left Social-Revolutionists, and all the other non-Bolshevik groupings, workers’ unions and cooperatives—G. M) ... “We shall be crushed if we do not oppose the threatened collapse, disorganization and mounting despair with an iron dictatorship of class-conscious workers. We shall be ruthless toward our enemies as well as toward all hesitant and noxious elements in our own midst, those that will dare to bring demoralization into our arduous task of building a new life for the toiling people”. The impression conveyed by this speech is that the described period from November 7, 1917, to April 29, 1918, was one which did not know of terror, this being the implication of Lenin’s complaint that the Soviet power was a “jellyfish.” But was the terror necessary in that period? Was the Soviet power in such desperate straits that it had to fall back upon “iron” as the final argument? According to the reiterated statements made by Lenin at that time there was hardly any civil war. There were only isolated attempts to incite such a war by way of mutinous outbreaks which were rapidly liquidated by the masses themselves. On March 7, 1918, Lenin addressed the members of the Seventh Convention of the Communist party: “The entire country was swept with a wave of civil war and everywhere we triumphed with great ease because the fruit was over ripe—because the masses have gone through the experience of a compromise policy with the bourgeoisie.” And further: “We have easily triumphed over Kaledin’s troops and have set up a Soviet Republic against a resistance that hardly deserves any attention”. “Also, that in October, November and December we had a walkover as far as our internal front against the domestic counter-revolution was concerned”. “Layer after layer—workers, peasants, soldiers, up to the toiling Cossacks, all those forces of the revolution gradually began to split off from the counter-revolutionary bourgeoisie. The Soviet power has definitely established itself in Russia”. “One can say with certainty that the Civil War in its main phases has been brought to an end. “Of course, there will be skirmishes here and there, shootings will break forth in some cities as a result of the scattered attempts to overthrow the revolutionary power made by the reactionaries, but there is no doubt that at the domestic front the reaction has been stifled by the effort of the people in arms”. “We have to continue the line of democratization and to make the right of recall essential to the functioning of the Soviets as the most consummate bearers of the idea of state and compulsion. And then the transfer of power from one party to the other will proceed in a peaceful manner, by way of mere elections”. Those statements, however, were a deliberate lie: Lenin said one thing while having in mind something altogether different. His statements were about the same as when he fought against capital punishment, which only two months later he stormily defended on the ground that during the revolution, capital punishment could not be abolished. Nor was the Soviet Power as supine as it was pictured by Lenin. From the very first day of its existence, it was launched upon its infamous terroristic course, and were Lenin’s declarations to be taken seriously, he, Trotzky, Stalin and the entire leadership of the party should have been placed on trial for exceeding power, for murders, and bloody butcheries, which violated the decree abolishing capital punishment. In spite of this decree, terror by shooting began as soon as Lenin appeared in Smolny. He started off, as related by Trotzky, in the above quoted article, by terrorizing the leaders of the Bolshevik party who published the decree abolishing the death penalty. The Revolutionary War Committee (“Revcom,” for abbreviation), egged on by Lenin, were shooting men at will; it was this practice initiated by them that created the winged phrases: “to dispatch to Dukhonin’s staff,” that is, to lynch or “to put to the wall”—an expression bequeathed to the newly formed Che-Ka. The idea of the latter was conceived by Lenin, and acting upon Lenin’s idea Dzerzhinsky drew up a plan for the Extraordinary Committee (Che-Ka) which was set up on December 27, 1917 and which started off with shootings, the abolition of the death penalty notwithstanding. “I herewith empower the peasants of the Mogilev government to take the law in their own hands when dealing with perpetration of violence”. The Commissar of the Northern region of Western Siberia issued an order in which he threatened: “In case the guilty ones are not turned over to the authorities, one person out of ten will be shot, irrespective whether he is guilty or not”. February 23, the German offensive began, and the government declared that “the Socialist Fatherland” is in danger. Upon that occasion a manifesto was issued  which stated: “Agents of the enemy, speculators, gangsters, counter-revolutionary agitators, German spies are to be shot on the spot”. Another item of this “manifesto” referred to the organization of the above mentioned battalions for digging trenches, and it stated: “All those battalions are to include all able-bodied members of the bourgeois class—men and women—and are to be placed under the surveillance of the Red-Guard men; those who resist are to be shoi”. The Ex-Commissar of Justice, I. Z- Steinberg, states in his book that Antonov-Ovseyenko (has since been arrested by Stalin, and is now waiting for his turn), “motivated by revenge and sheer demagogy, and acting upon his own discretion, dispatched the members of the Council of Metallurgical and Mining Industry of the South, to do forced labor in the mines” and that “Lenin openly approved by telegram this savage act by Antonov.” Steinberg also maintained in the same book that “in March 1918, the Executive Committee of the Soviet of Rostov on Don seriously discussed the question of summarily executing all the leaders of the local Mensheviks and right wing Social-Revolutionists; the question was discussed but was not decided upon for the lack of a majority in its favor”. On the night of April 12, an armed force, acting upon government orders, smashed the Anarchist organizations of Moscow. Against those organizations the government forces threw in action not only rifles and machine guns, but also cannons. This “military expedition” resulted, according to M. Y. Latzis,  “in 30 casualties—killed and wounded—on our part—12” All that was done under the slogan of fighting “banditry in the Anarchist ranks”, but the real cause lies elsewhere. It was laid open by Lenin in his, “A letter to the Comrades” (issued in September, 1917) in which he wrote that: “All agree in characterizing the prevailing mood of the masses of people as one nearing despair and as one giving rise to the generally acknowledged fact of growing Anarchist influence”. In addition to the eighteen killed and wounded Anarchists, it is rather difficult to ascertain the exact number, the Che-Ka killed the arrested Anarchist Khodounov, during an alleged “attempt to escape”. From that time on persecutions of Anarchists continued at an ever growing rate and by the use of all kinds of means and methods. And even that does not give a full picture of the unbridled terror prevailing at that time, it being difficult to reconstruct the picture of the terroristic activity of the Military-Revolutionary Committees functioning in 1917 prior to the formation of the AU-Russian Che-Ka. All those terroristic brutalities were committed in spite of the decree abolishing the death penalty. They were committed without the approval of the All-Russian Central Executive Committee of the Soviets, without the sanction of the Convention of the Soviets. Consequently, the Government headed by Lenin and his henchmen are subject to indictment on the counts of murder and violation of the rights and liberties of the citizens. And with all that, Lenin had the temerity to declare that the Soviet power was “jelly-like and not iron-like,” at that period. And well it might have been “jelly-like,” only the jelly was of human blood, shed by iron. But this was not enough for Lenin: he demanded more executions and more blood. And so, beginning with April 29, there was unloosed a mad bacchanalia of terror headed by Lenin himself. E. Vandervelde, “Le Jubilee du Manifeste Communiste”; appeared in “People,” March 28, 1898, Brussels. The quotation is taken from V. Cherkesoff’s book, “Predtechni Internazionala” (The Forerunners of the International); p. 55, 1920, Moscow. N. Lenin (V. Uljanoff), Sobranie Sochineniy, p. 30, vol. XVIII, part 2; 1923, Moscow. N. Lenin, Sobranie Sochineniy, pp. 17-18, vol. XIV, part 1. N. Lenin, “A Speech Before Soldiers,” p. 75, vol. XIV, part1. N. Lenin, “The Task of the Proletariat in Our Revolution,” pp. 48-49, vol. XIV, part 1. N. Lenin, “On Dual Power,” p. 25, vol, XIV, part 1. N. Lenin, “The Convention of Peasants’ Deputies,” p. 90, vol. XIV, part 1. N. Lenin, “Whither Do the Counter-Revolutionary Measures of the Provisional Government Lead Us,” p. 129, vol. XIV, part 1. See also “A Question of Principle,” p. 226. N. Lenin, “Our Views,” p. 92, vol. XIV, part 1. N. Lenin, Sobranie Sochineniy, p. 129, vol. XIV, part 1. N. Lenin, “The Lessons of the Revolution,” p. 33, vol XIV, part 1. N. Lenin, Sobranie Sochineniy, “How to Assure Successful Elections to the Constituent Assembly (On Freedom of the Press),” pp. 112-113, vol. XIV, part 2. N. Lenin, Sobranie Sochineniy, “The Perplexed and the Frightened,” p. 2S4, vol. XIV, part 1. N. Lenin, “Hints,” p. 244, vol. XIV, part 1. N. Lenin, “Contradictory Positions,” p. 2S9, vol. XIV, part 1. N. Lenin, “The Bolsheviks Have to Take the Power,” p. 134, vol. XIV, part 1. N. Lenin, Sobranie Sochineniy, “The Report on the Work of the Central Committee of the Russian Communist Party, March 27, 1922,” pp. 54-55, vol. XVIII, part 2. L. Trotzky, “Lenin and the Work in the Government,” “Pravda,” Jan. 23, 1924, Moscow. N. Lenin, Sobranie Sochineniy, “Annotations,” pp. 640- 641, annot. 18, vol. XV. N. Lenin, “The Next Problems of the Soviet Power,” p. 195, vol, XV. N. Lenin, Sobranie Sochineniy, “Will the Bolsheviks Succeed in Holding the State Power,” p. 241, vol. XIV, part 2. N. Lenin, “The Answer to the Interpellation of the Left Social-Revolutionists,” annotations, p. 27, vol. XV. Quoted by K. Kautsky in his book: “From Democracy to State Slavery,” p. 48, Russian edition, 1922, Berlin. The word “our” is omitted by Lenin, who thereby distorted the meaning of the statement in which Engels is made to refer to the State in general and not to “our” State. N. Lenin, Sobranie Sochineniy, “Proletarian Revolution and the Renegade Kautsky,” p. 451, vol. XV. N. Lenin, Sobranie Sochineniy, “A Report on the Activity of the Central Coinmittee of the Russian Communist Party; the Session of March 27, 1922,” p. 3S, vol. XVIII, part 2. N. Lenin, Sobranie Sochineniy, “The Tasks of the Soviet Power,” p. 205, vol. XV. Gotz, one of the oldest leaders of the Social-Revolutionary Party; Kornilov, former supreme commander; Dutov and Bogayevsky, Cossack generals; Gheghechkori, one of the leaders of the Social-Democratic Party of Russia and Georgia. N. Lenin, p. 221, vol. XV. N. Lenin, “Kautsky the Renegade,” p. 509, vol. XV. N. Lenin, “On the Petty-Bourgeois Parties,” p. 569. N. Lenin, “A Report on the Work of the Council of People’s Commissars,” p. 75, vol. XV. N. Lenin, p. 387, vol. XV. N. Lenin, “On the Situation in Soviet Russia,” p. 398, vol. XV. N. Lenin, “The Report of the Council of People’s Commissars,” p. 377, vol. XV. N. Lenin, “The Character of Our Newspapers,” p. 419, vol. XV. N. Lenin, “On Workers’ Cooperation,” p. 585, vol. XV. N. Lenin, “The Proletarian Revolution and the Renegade Kautsky,’ p. 450, vol. XV. N. Lenin, Sobranie Sochineniy, “Disingenious Speeches on Freedom,” (November 11, 1920), p. 379, vol. XVII. N. Lenin, Sobranie Sochineniy, “A Speech Delivered at the Second All-Russian Convention of Representatives of the Political Sections of the Army” (October, 1921), p. 375, vol. XVIII, part 1. N. Lenin, “The Concluding Speech” (March 9, 1921), pp. 128-129, vol. XVIII. N. Lenin, Sobranie Sochineniy, “A Speech Delivered at the Conference About Work in the Villages” (June 30, 1920), p. 226, vol. XVIII. N. Lenin, Sobranie Sochineniy, “A Report on the Activity of the Central Committee of the Russian Communist Party” (March 27, 1921), pp. 35-37, vol. XVIII, part 2. N. Lenin, Sobranie Sochineniy, p. 207, vol. XIV, part 2. N. Lenin, Sobranie Sochineniy, “The Declaration of the Cadets by Enemies of People,” Speech delivered at All-Russian Central Executive Committee (December 1, 1917), p. 47, vol. XV. N. Lenin, “Left Infantility and Petty-Bourgeois Habit,” p. 268, vol. XV. N. Lenin, Sobranie Sochineniy, p. 207, vol. XVIII, part 1. N. Lenin, Sobranie Sochineniy, “Will the Bolsheviks Retain the State Power?” p. 234, vol. XIV, part 2, September, 1917. As to this understanding, see L. Trotzky’s article “Lenin and the Work in the Government,” which we cite in full in this work. N. Lenin, Sobranie Sochineniy, p. 26, vol. XV. N. Lenin, “On Right to Recall and Re-election of the Members of the Constituent Assembly,” speech delivered at All-Russian Central Executive Committee, November 21, 1917, p. 40, vol. XV. N. Lenin, “The Speech Delivered at the Convention of the War Fleet,” November 22, 1917, pp. 41-42, vol. - XV. N. Lenin, “On the Nationalization of the Banks,” a remark made at the All-Russian Central Executive Committee, December 14, 1917, p. 49, vol. XV. N. Lenin, “A Report on the Activity of the Council People’s Commissars” (January 14, 1918), p. 76, vol. XV. N. Lenin, “The Concluding Speech,” p. 89, vol. XV. N. Lenin, Sobranie Sochineniy, p. 96, vol. XIV, part 2. N. Lenin, “A Letter to the Party Central Committee,” p. 96, vol. XIV, part 2. Chernov, leader of the Party of the Social-Revolutionists; Tzereteli, leader of the Russian and Georgian Social- Democratic Parties; “Dielo Naroda” — publication of the Party of Social-Revolutionists. N. Lenin, Sobranie Sochineniy, “Report on the Brest Peace” (March 14, 1918), p. 176, vol. XV. N. Lenin, “The Speech Delivered at Moscow Soviet” (April 23, 1918), 188, vol. XV. Ibid, “Report on Brest Peace” (March 7, 1918), p. 124, vol. XV. N. Lenin, “Report on Brest Peace” (March 14, 1918), p. 173. N. Lenin, “A Speech delivered at Moscow Soviet” (April 23, 1918), p. 186, vol. XV. N. Lenin, “On the Land Question,” p. 20, vol. XV. N. Lenin, “On Right to Recall and Re-elect of the Members of the Constituent Assembly” (November 21, 1917), pp. 40-41, vol. XV. See Lenin’s letter in “Pravda,” December 27, 1927. See “Znamia Truda,” February 23, 1918. The author of this “Manifesto” was L. Trotzky; see his article which was already used. I. Z. Steinberg, “The Moral Visage of the Revolution,” p. 31, Russian edition, Berlin, 1923. M. Y. Eatiis (Soudrabs), “Two Years of the Struggle on the Internal Front,” p. 62, Russian edition, Moscow, 1920. N. Lenin, Sobranie Sochineniy, p. 283, vol. XIV, part 2. Meshok—Sack, bag; the poor people, mostly workers, who against the State Grain Monopoly were trying to bring from the villages for their families a bag or two of flour or grain—a bag contains 36-72 English pounds—were called meshechniki, sing, meskechvik.